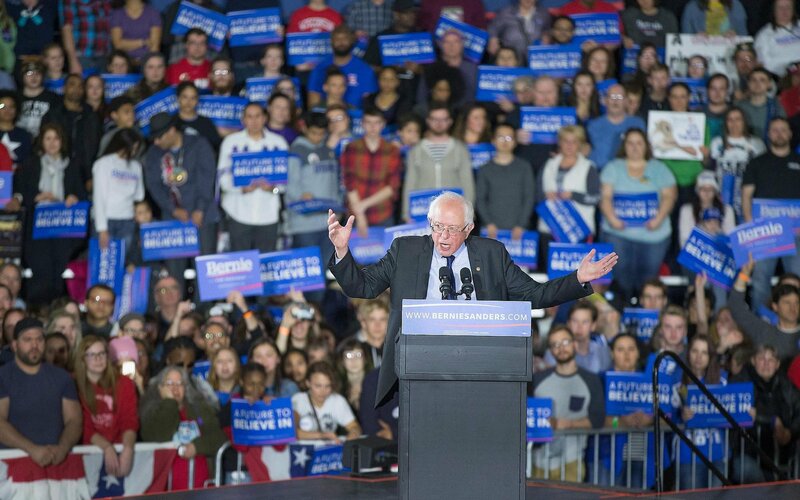 By Tom Kertscher on Monday, March 28th, 2016 at 11:36 a.m.
Campaigning in Madison, Democratic presidential candidate Bernie Sanders made claims about wealth inequity and asserted that the United States doesn't compare well with other developed nations in terms of incarceration, health care and paid family leave. Here's a fact-checking rundown of the March 26, 2016 speech, based on claims the Vermont senator has made previously that have been rated by PolitiFact. In each instance, the claim Sanders repeated was rated Half True or better. "The top one-tenth of 1 percent" of Americans "now owns almost as much wealth as the bottom 90 percent." Sanders made the same claim the last time he was in Madison, in July 2015. We rated that earlier claim Mostly True. The claim repeats a finding from a study by two internationally known economists. That finding was supported by two other major economists we contacted. But the study has been criticized, for example, for not including Social Security in the wealth calculations. "The Walton family of Walmart owns more wealth than the bottom 40 percent of the American people." PolitiFact Virginia’s rating was True after Sanders made the same statement in February 2016. The latest available figures, for 2013, put the wealth of the six relatives of Walmart founder Sam Walton at $145 billion -- equal to the total wealth of the entire bottom 43 percent. America has "more people in jail than any other country on Earth." Sanders made the same claim in October 2015. PolitiFact National rated it Mostly True. The latest federal census showed there were more than 2.2 million people behind bars -- in prison, as well as jail -- in the United States. A research center in England said China ranked second with about 1.65 million prisoners. But the Chinese figure didn’t include many thousands of people in detention centers, and we don’t know how many that would be. Every major country but the United States guarantees "health care to all people as a right." Sanders used nearly the same words in making that claim in November 2015. PolitiFact National’s rating then was Half True. Among the wealthy nations that make up the Organization for Economic Cooperation and Development, the United States -- with the possible exception of Mexico -- stood out as the only one lacking universal coverage. The question of a guaranteed right to health care is murkier. Sanders spoke as though every advanced economy has it. But some do and some don’t. The United States is "the only country in the industrialized world" that does not "guarantee health care to all." When Sanders made that version of his statement in June 2015, it was also rated Half True. The United States is "the only major country on Earth not to guarantee paid family and medical leave." In October 2015, Sanders made a similar but narrower claim, saying that every other major country has family paid leave specifically. PolitiFact National’s rating then was Mostly True. Two comprehensive studies of multiple nations backed that earlier claim. One found that the United States is the only country to offer no statutory entitlement to paid leave on a national basis. The other found that the U.S. and Papua New Guinea were the only two not to provide cash benefits to women during maternity leave. The only caveat here was that family leave isn’t a universal benefit in some countries, due to exclusions on certain workers.